On Friday, November 21, PLEA received calls from various work units reporting that an unsigned document attacking PLEA Treasurer Joe Clure had begun showing up in work location mail boxes. Joe Clure is currently running for election for an upcoming vacancy on the local Phoenix Police Pension Board (PSPRS), which will be vacated when Sgt. Ron Snodgrass retires in December. Joe’s only opponent in this campaign is a PPSLA Board member. PLEA finds it interesting that the anonymous person/s who oppose Joe and authored a document rife with inaccuracies and lies are too cowardly to put a name to it. The author/s took it upon themselves to attack State Senator elect Russell Pearce who has been a good friend and partner to PLEA members. PLEA members should be aware that Russell Pearce is himself a retired and decorated Arizona Law enforcement Officer who was injured in a police shooting in the line of duty several years ago. Representative Pearce also has a son who is currently serving as an active law enforcement officer in the state of Arizona and who has also been seriously injured in a line of duty police shooting. A person with this background and history is not one who takes benefits away from cops nor would PLEA support such a person. The anonymous mailer sent to the work units is the act of a desperate individual/s who will do whatever it takes to keep a rank and file police officer perspective off of the pension board. Police Mangement has had a monopoly on the police pension board positions for far too many years which is why we need someone with Joe Clure’s knowledge and experience to occupy the seat. We need someone who will look out for the interests of the rank and file street Officer. 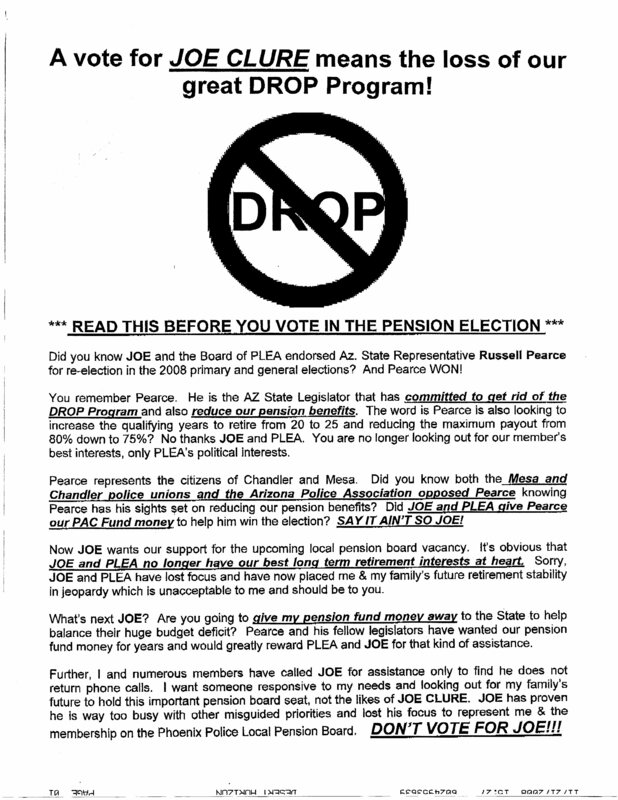 The anonymous flyer was of significant enough concern to Senator elect Pearce that he came to his office on a Saturday to author a direct response to these false and inaccurate statements for the PLEA membership to read. See attached letter from Senator elect Pearce in the link posted to the right or CLICK HERE to read the response. CLICK HERE to read the letter written by State Senator elect Russell Pearce.